The Black Cats have been seeking a replacement for David Moyes since he resigned last month in the wake of relegation to the Championship, and they appear to have honed in on Dons boss McInnes. 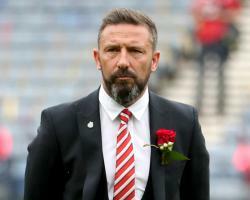 It is understood Sunderland have now officially approached Aberdeen regarding the manager who led the Pittodrie side to a runners-up finish in last season's Ladbrokes Premiership and two cup finals. All three clubs relegated out of the Premier League started the summer looking for new bosses and Sunderland are the only one still managerless after Hull appointed Leonid Slutsky and Middlesbrough recruited Garry Monk. It is thought the Black Cats identified McInnes as their preferred candidate some time ago and the process may now move forward quickly after he returned from holiday. The 45-year-old is in his third managerial job having won promotion with St Johnstone prior to being lured back south of the border to take charge of Bristol City in 2011. McInnes lasted just over a year in the south west and was sacked by the club in January 2013 when they were bottom of the Championship, yet he has rebuilt his reputation at Pittodrie. He led the club to their first piece of silverware in 19 years when they won the Scottish League Cup in 2014 and the Dons finished each of the previous three seasons in second place in the league. However, having finished 30 points behind Celtic, who also beat them in both finals, McInnes could now be tempted by the challenge of bringing Sunderland back to English football's top flight. The Black Cats may also be able to offer their new boss a significant transfer kitty having on Tuesday agreed a deal with Everton for goalkeeper Jordan Pickford which could reach Â£30million.